I’ve been enjoying the addition of dotnet CLI global tools and figured I’d blog the ones I use. I’ll also include a PowerShell script that is used to install them (or, if they’re installed, update them). The list is current as of this writing, but you can visit the gist (below) to see the set of tools I’m using at any given time. dotnet-depends: Shows the dependency tree for a .NET project. dotnet-outdated: Shows outdated packages referenced by a .NET project. dotnet-format: Formats code based on EditorConfig settings. dotnet-script: Run C# script (.csx) files. dotnetsdkhelpers: A global tool version of the original SDK installer helpers that addresses the need for external tools and fixes a couple of bugs with the original. microsoft.web.librarymanager.cli: dotnet CLI access to the libman dependency manager for JS. Azure DevOps has the ability to publish things to a private NuGet feed as part of its artifacts handling. Working with a private feed from a developer machine running builds from the command line or Visual Studio is pretty easy. There is documentation on using a NuGet credential provider to authenticate with Azure DevOps and make that seamless. However, getting this to work from a pipeline build is challenging. Once you’ve published a package, you may want to consume it from something else you’re building… but the feed is secured. What do you do? I’m told there are improvements for this coming in Q2 2019. I can’t quantify what those improvements are, but it may mean things start to “just work.” Until then, here are ways to work around the challenges. The documentation shows how to use NuGet or the dotnet CLI for package restore from your feed. Both of the solutions effectively amount to separating the call to NuGet restore or dotnet restore from the rest of your build. For NuGet, you’d use a NuGet build step (NuGetCommand@2) and specify the restore. Do that before you execute the build on your solution. For the dotnet CLI, you’d use a dotnet CLI build step (DotNetCoreCLI@2) and indicate the restore command. In both cases, the special build command will generate a NuGet.Config file on the fly that contains the system access token. The restore operation will use that custom temporary config during the restore and it will succeed. However, if you later try running dotnet build or dotnet publish it’ll fail - because there’s an implicit restore that runs during those. These will not have the system credentials in place. You have to use --no-restore on builds, for example, to avoid the auto-restore. It can get painful in a larger build. If you have a build script, like a bash or PowerShell script, manually executing dotnet restore in that script will also not work. You must use the build tasks to get the magic to happen. Another option in the docs is that you can use the Azure Artifacts credential provider. While it seems this is primarily geared toward running on build agents you host yourself, you can possibly get this working on hosted agents. I have not tried this myself. I went with option 3, below. However, if you want to give it a shot, here’s what you’d do. First, you’ll want to be aware of how NuGet credential providers work. I don’t mean the internals, but, like, where you need to put the credential provider executable to make it work and how to troubleshoot it. All of that is documented. Download the latest release of the credential provider. Make sure you get the version that will run on your build agent, not your development machine. Follow the instructions in the readme to find the self-contained executable version of the credential provider in the archive you just downloaded. Extract the credential provider to somewhere in the source you’ll be building. Maybe a separate build folder. Set the NUGET_CREDENTIALPROVIDERS_PATH to point to the build folder in your checked-out source that contains the provider. On Linux, you may need to chmod +x that provider. In the VSS_NUGET_EXTERNAL_FEED_ENDPOINTS you’ll notice the use of the $(System.AccessToken) variable. That’s a predefined system variable in Azure DevOps build pipelines. You’ll see that again later. Anyway, if all the planets have aligned, when you run your standard dotnet restore or NuGet restore, it will use the credential provider for authentication. The credential provider will use the environment variable and magic will happen. One other note there - the username vsts isn’t special. It can be any value you want, the endpoint doesn’t actually end up checking. It just can’t be omitted. The final option is to update your NuGet.Config on the fly with the system access token as part of the build. I went with this option because it was simpler and had fewer moving pieces. The name, Azure DevOps, is the key here. Doesn’t matter what you name it, just make sure you remember it. You’ll need it. In your build pipeline, before you do any operations to build or restore packages, Use the NuGetCommand@2 task and run a custom command to update the source in that NuGet.Config to have the system credentials attached. What this will do is add the credentials right into the XML of the NuGet.Config as checked out in your source. The NuGet or dotnet commands will already be using that config file to locate your feed, the creds will come along for free. Again, you see that $(System.AccessToken) show up. That’s the magic. You need to have -StorePasswordInClearText or the dotnet CLI won’t be able to use the credentials. If you’re only using NuGet commands, you should be OK not storing in clear text. If you’re on a Linux agent, don’t forget filenames are case-sensitive. If you get an error, make sure you got all the capitalization right for your config file. Spinnaker is a great tool for continuous deployment of services into Kubernetes. It has a lot of first-class integration support for things like Docker containers and Google Cloud Storage blobs. For example, say you have a Docker container that gets deployed to Kubernetes via a Helm-chart-style manifest. You might store the manifest in Google Cloud Storage and the Docker container in Google Cloud Registry. Change one of those things, it triggers a pipeline to deploy. This is not so easy if you are in Azure and storing your manifests in Azure Blob Storage. You can make this work, but it takes a lot of moving pieces. I’ll show you how to get this done. You might wonder why I’m interested in doing any of this when there are things like Azure DevOps that can do deployment and Azure Helm Repository to store Helm charts. Just sidestep the issue, right? Azure DevOps is great for builds but doesn’t have all the deployment features of Spinnaker. In particular, if you want to use things like Automated Canary Analysis, Azure DevOps isn’t going to deliver. Further, Azure DevOps is kind of a walled garden. It works great if you keep everything within Azure DevOps. If you want to integrate with other tools, like have artifacts stored somewhere so another tool can grab it, that’s hard. Azure DevOps can publish artifacts to various repo types (NuGet, npm, etc.) but really has no concept of artifacts that don’t get a semantic version (e.g., stuff that would happen in a continuous delivery environment) and aren’t one of the supported artifact types. Universal packages? They need semantic versions. So what if you have a zip file full of stuff that just needs to be pushed? If Azure DevOps is handling it in a pipeline, you can download build artifacts via a pipeline task… but from an external tool standpoint, you have to use the REST API to get the list of artifacts from the build and then iterate through those to get the respective download URL. All of these calls need to be authenticated but at least it supports HTTP Basic auth with personal access tokens. Point being, there’s no simple webhook. Azure Helm Repository is currently in beta and has no webhook event that can inform an external tool when something gets published. That may be coming, but it’s not there today. It also doesn’t address other artifact types you might want to handle, like that arbitrary zip file. Publishing a new/updated blob to Azure Blob Storage will raise an event with Azure EventGrid. 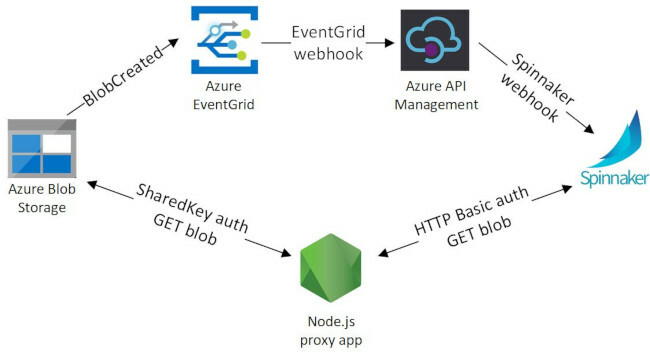 A subscription to Azure EventGrid for “blob created” events will route the EventGrid webhooks to an Azure API Management endpoint. The Azure API Management endpoint will transform the EventGrid webhook contents into a Spinnaker webhook format and forward the transformed data to Spinnaker. Spinnaker will use HTTP artifacts to download the Azure Blob. The Spinnaker download request will be handled by a small Node.js proxy that converts HTTP Basic authentication to Azure Blob Storage “shared key” authentication. Most of this is required because of the security around EventGrid and Azure Blob Storage. There’s not a straightforward way to just use a series of GET and POST requests with HTTP Basic auth. This is where you will store your artifact blobs. Your blobs will get downloaded via URLs like https://myartifacts.blob.core.windows.net/artifacts/artifact-name.zip. If you want to download from Azure Blob Storage without making the artifacts publicly accessible, you need to use SharedKey authentication.. It looks a lot like HTTP Basic but instead of using a username/password combination, it’s a username/signature. The signature is generated by concatenating several headers and generating a signature using your shared key (available through the Azure portal). It’s complicated and not something built into Spinnaker. If you really want to see how to generate the signature and all that, the docs have a very detailed explanation. The short version here is that you probably want a client SDK library to do this work. Since Spinnaker really only supports HTTP Basic anyway, you need to take in username:password in some form and convert that into the request Blob Storage expects. Richard Astbury has a great blog article showing a simple web server that takes in HTTP Basic auth where your storage account name is the username and the storage account key is the password, then proxies that through to Blob Storage for download. 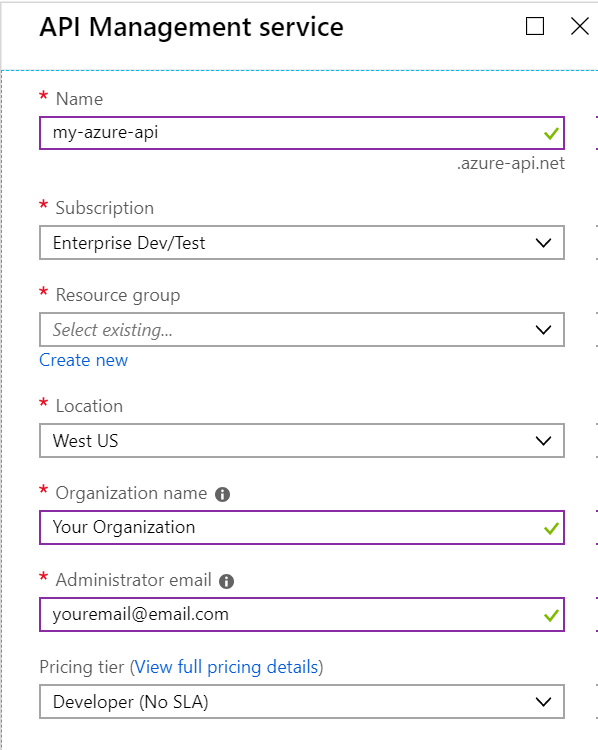 Deploy this proxy somewhere you can access like an Azure App Service. I converted this to be an Express app without too much trouble, which adds some logging and diagnostics to help with troubleshooting. Run in HTTPS only mode using a minimum TLS 1.2. These are options in the Azure App Service settings. You’ll be using HTTP Basic auth which isn’t encrypted, so ensuring the communication itself is encrypted is important. Consider adding more layers of security to ensure random people can’t just use your proxy. Azure App Service apps are public, so consider updating the app to only respond to requests to a special endpoint URL that contains a key only you know. You could also ensure you only respond to requests for known storage account info, not just ay info. That would mean folks need the special endpoint URL and the storage account info to get anything. Ensure it’s “always on.” Azure App Service apps go to sleep for a while when they’re idle. The first request can time out as it wakes up, and if Spinnaker is the first request it’ll cause a pipeline failure. For this walkthrough, we’ll say your Blob Storage proxy app is at https://mycoolproxy.azurewebsites.net. You’ll see this show up later as we set up the rest of the pieces. When Spinnaker wants to download an HTTP artifact, it’ll access https://mycoolproxy.azurewebsites.net/artifacts/artifact-name.zip instead of accessing the Blob Storage URL directly. You should now be able to access an Azure Blob Storage blob via your proxy using HTTP Basic authentication. Verify this works by dropping a blob into your artifact storage and downloading it through the proxy. Spinnaker needs to know that it can expect artifacts to come in via webhooks. To do that, you need to enable the artifacts. Edit the .hal/default/profiles/echo-local.yml file to enable it. The webhook will tell Spinnaker where the artifact lives, but you have to also enable Spinnaker to download the artifact. You also have to provide it with credentials to do so. There is good doc explaining all this but here’s a set of commands to help you. # Now back up the config. # Immediately restore the backup you just made. # Verify the local upfile.txt isn't being used anymore. Spinnaker now knows not only that webhooks will be supplying artifact locations, but also how to provide HTTP Basic credentials to authenticate with the artifact source. At the time of this writing I don’t know how Spinnaker handles multiple sets of credentials. For example, if you already have some HTTP Basic artifact credentials set up and add this new set, how will it know to use these new creds instead of the ones you already had? I don’t know. If you know, chime in on this GitHub issue! You should now have enough set up to enable Spinnaker to download from Azure Blob Storage. If an artifact URL like https://mycoolproxy.azurewebsites.net/artifacts/artifact-name.zip comes in as part of an HTTP File artifact, Spinnaker can use the supplied credentials to download it through the proxy. Azure API Management Service is usually used as an API gateway to allow you to expose APIs, secure them, and deal with things like licensing and throttling. 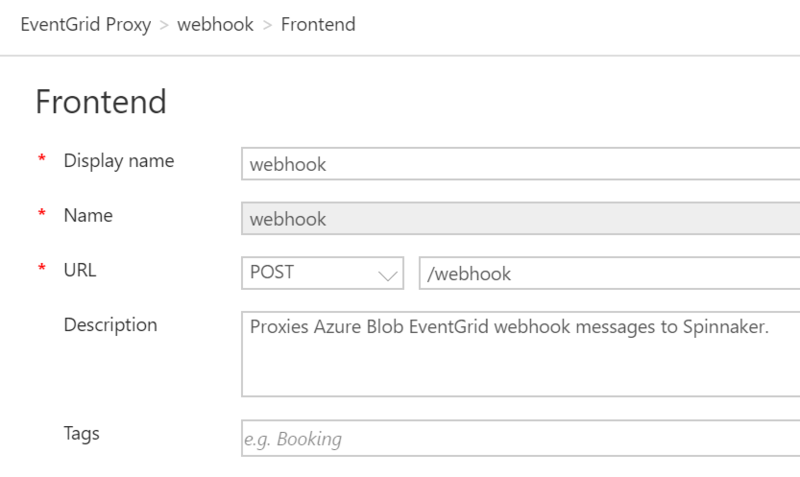 We’re going to take advantage of the API Management policy mechanism to handle Azure EventGrid webhook notifications. This part is based on this awesome blog article from David Barkol. Using API Management policies enables us to skip having to put another Node.js proxy out there. Why not use API Management for the Blob Storage proxy? I wasn’t sure how to get the Azure Blob Storage SDK libraries into the policy and didn’t want to try to recreate the signature generation myself. Lazy? Probably. Handshaking with EventGrid for webhook subscriptions. EventGrid doesn’t just let you send webhooks wherever you want. To set up the subscription, the receiver has to perform a validation handshake to acknowledge that it wants to receive events. You can’t get Spinnaker to do this, and it’s nigh impossible to get the manual validation information. Transforming EventGrid schema to Spinnaker Artifact schema. The data supplied in the EventGrid webhook payload isn’t something Spinnaker understands. We can’t even use Jinja templates to transform it at the Spinnaker side because Spinnaker doesn’t want an inbound webhook to be an array - it wants the webhook to be an object that contains the array in a property called artifacts. We can do the transformation work easily in the API Management policy. First, create your API Management service. This can take a long time to provision, so give it a bit. When it’s done, your API will be at a location based on the API Management Service name, like https://my-azure-api.azure-api.net. All the APIs you hang off this management service will be children of this URL. Once it’s provisioned, go to the “APIs” section. By default, you’ll get a sample “Echo” API. Delete that. Now, add a new “Blank API.” Call it “EventGrid Proxy” and set the name to eventgrid-proxy. For the URL scheme, be sure to only select HTTPS. Under “Products,” select “Unlimited” so your developer key for unlimited API calls will be in effect. In the EventGrid Proxy API, create a new operation called webhook that takes POST requests to /webhook. The webhook operation doesn’t do anything except give us a valid endpoint to which EventGrid can post its webhook notifications. On the EventGrid Proxy api, select “Design” and then click the little XML angle brackets under “Inbound Processing.” This will get you into the area where you can set up and manage API policies using XML. // Replace this with YOUR Blob and proxy info! Again, update the URL endpoints as needed in there! The location of your Spinnaker API (deck) endpoint for the webhook. This is always at /webhooks/webhook/sourcename where I’ve used azureblob for the source but you could use whatever you want. The source name is used in the pipeline configuration for webhooks. The location of your Blob Storage and Blob Storage Proxy. These got set up earlier - in the Replace call up there, you need to swap your Blob Storage server location for the location of your proxy so when Spinnaker tries to download, it’ll go through your proxy. I’m not going to dive too deep into API policy management. I recommend reading the official docs and being aware of what is available. However, I will explain what this policy does and how it works. Whenever something comes from EventGrid it includes an Aeg-Event-Type header. The two header values we’re concerned with are SubscriptionValidation and Notification. If there’s no header, return a 404. Whatever the request wants, we can’t support it. If the header is SubscriptionValidation, EventGrid wants a handshake response to acknowledge we expect the subscription and want to handle it. We grab a validation code out of the inbound request and return a response that includes the code as an acknowledgement. The reference is the download URL location through your proxy to the blob. The name is the subject of the EventGrid event. The policy does this transformation and then forwards the EventGrid event on to your Spinnaker webhook endpoint. You should now be able to POST events to Spinnaker via API Management. Using the example EventGrid body above or the one on the Microsoft docs site, make modifications to it so it looks like it’s coming from your blob store - update the locations, container name, and filename as needed. Use the “Test” mechanism inside Azure API Management to POST to your /webhook endpoint and see if it gets forwarded to Spinnaker. Make sure you add an Aeg-Event-Type header to the request or you’ll get the 404. Inside the test area you can see the trace of execution so if it fails you should see exception information and be able to troubleshoot. EventGrid needs to send events to your new API endpoint so they can be proxied over to Spinnaker. In the Azure Portal, in the API Management section, take note of your API key for “Unlimited” - you associated this key with the API earlier when you created it. You’ll need it for creating the subscription. You only want the Microsoft.Storage.BlobCreated event here. If you create or overwrite a blob, the event will be raised. You don’t want the webhook to fire if you delete something. This may take a few seconds. In the background, EventGrid is going to go do the handshake with API Management and the policy you put in place will respond. This is easier to watch in the Azure Portal UI. You now have Azure Blob Storage effectively raising Spinnaker formatted webhooks. 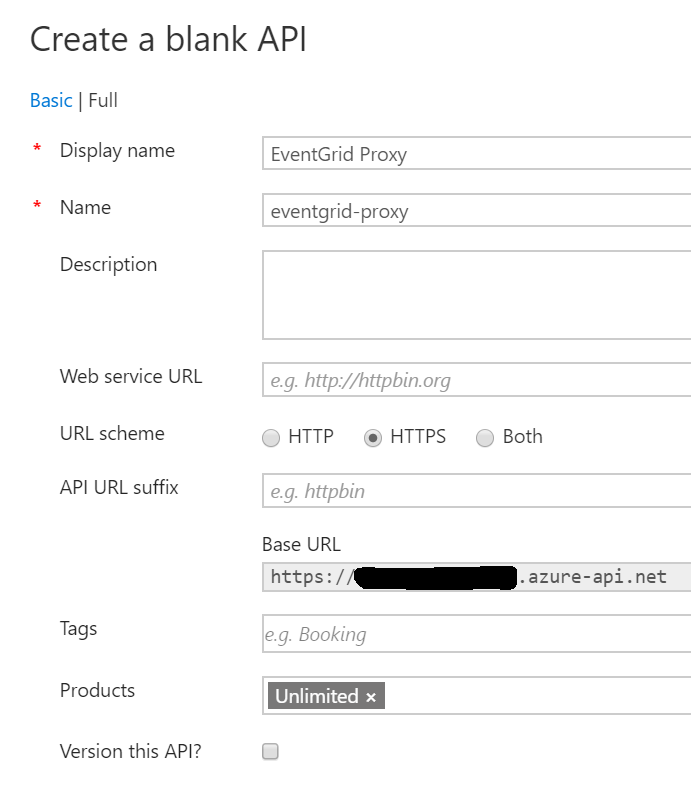 Azure Blob Storage causes EventGrid to raise a webhook event, API Management policy intercepts that and transforms it, then it gets forwarded on to Spinnaker. You can trigger pipelines based on this and get artifacts into the pipeline. Create a simple Helm chart. Just a Kubernetes Deployment, no extra services or anything. You won’t actually deploy it, you just need to see that some sort of retrieval is happening. Let’s say you called it test-manifest so after packaging you have test-manifest-1.0.0.tgz. Create a simple pipeline in Spinnaker. Add an expected artifact of type http/file. Specify a regex for “Name” that will match the name property coming in from your webhook. Also specify a “Reference” regex that will match reference. In the “Automated Triggers” section, add a webhook trigger. Give it a source name that lines up with what you put in the API Management policy. In the example, we used azureblob. Also add an artifact constraint that links to the expected artifact you added earlier. 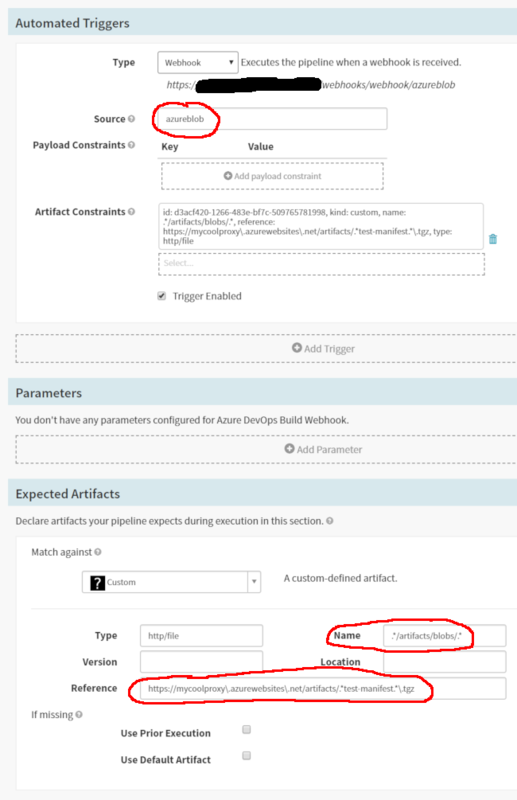 This ensures your pipeline only kicks off if it gets the artifact it expects from the webhook payload. In the pipeline add a “Bake (Manifest)” step. 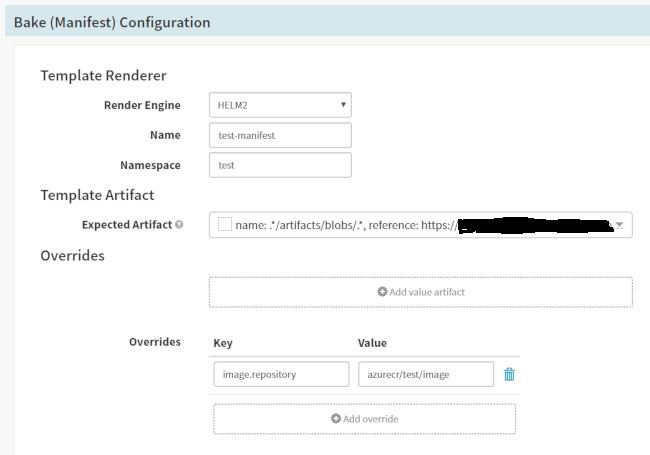 For the template artifact, select the .tgz artifact that the webhook will be providing. Fill in the name and namespace with whatever you want. Add an override key that will be used in the template process. Now use the Azure Portal to upload your test-manifest-1.0.0.tgz “artifact” into your Azure Blob Storage container. This should cause the webhook to be raised, eventually making it to Spinnaker. Spinnaker should see the artifact, kick off the pipeline, and be able to download the Helm chart from Blob Storage so it can run the Helm templating step. On the finished pipeline, you can click the “Source” link in the Spinnaker UI to see a big JSON object that will contain a huge base-64 encoded artifact that is the output of the “Bake (Manifest)” step. If you decode that, you should see your simple Helm chart, templated and ready to go. What do you look at if it’s not working? There are a lot of moving pieces. Verify the credentials you configured in Spinnaker. The username should be the blob storage account name and the password should be the shared key you got out of the Azure Portal. Try doing a download through your HTTP Basic proxy using those credentials and verify that still works. Run a test in API Management. The “Test” section of API Management lets you simulate an event coming in from EventGrid. Use the “Trace” section in there to see what’s going on and what the response is. Did the transformation fail? Look at Spinnaker “echo” and “deck” pod logs. I’m a big fan of the stern tool from Wercker for tailing logs of pods. It’s easy to watch logs in real time for doing something like: stern 'spin-(echo|deck). *' -n spinnaker -s 5s Make a test request from API Management and watch the logs. Do you see any errors fly by? Ensure you haven’t changed any keys/names. The Azure Blob Storage key, the API Management key, the source name in the Spinnaker webhook… all these names and keys need to line up. If you rotated keys, you need to update the appropriate credentials/subscriptions. Is something timing out? If you don’t have the “Always On” feature for your Azure Blob Storage proxy, it will go to sleep. The first request will cause it to wake up, but it may not be fast enough for Spinnaker and the request to download may time out. Test with large files. I didn’t test the Azure Blob Storage proxy thing with anything larger than a few hundred kilobytes. If you’re going to need support for gigabytes, you should test that. Add security around the Spinnaker webhook. The Spinnaker webhook endpoint doesn’t have any security around it. There’s no API key required to access it. You could make the “source” for the webhook include some random key so no hook would be raised without matching that source. If you have to rotate it that might be a challenge. This also might be something to file as an enhancement on the Spinnaker repo. Add security around the Azure Blob Storage proxy. You definitely need to have your basic creds in place for access here, and you need valid credentials for a storage account… but (at least in the Astbury blog article) there’s no limit on which storage accounts are allowed. You might want a whitelist here to ensure folks aren’t using your proxy to access things you don’t own. A couple of coworkers were at a conference and we were talking about how the sessions are going. One of them mentioned that there is a lot about “getting started” on various technology but very little content about what you do once you’re past that. This is something I’ve noticed for a while now. I mentioned it here way back in 2009 talking about enterprise-level ASP.NET application challenges. It’s one of the reasons I wrote a deep dive on .NET Core configuration. Today it occurred to me why this may be the case. There will always be more developers out there who are unfamiliar with a topic than those who are familiar. Maybe they’re hobbyists just checking something new out, maybe they’re contractors going from one project to another, maybe they’re students trying to learn new things. Whatever the case may be, those folks will always outnumber the people who already know about the topic. As such, when a company surveys developers about what documentation is the most valuable, or what features in the IDE are most interesting, or what experience they really need optimized… the “getting started” experience would naturally bubble to the top. Statistically, more people are interested in that. And that’s not a bad thing - you likely do want as many people as possible to use whatever thing it is you’re publishing. Getting new developers and efforts going is a good thing. I understand why I’ve never seen that - there’s no great way to properly administer that survey. How do you locate the target audience and ensure they’re the ones answering? How much will it cost to do that work? And even if you could figure it out, again, statistically, those folks are in the minority. The value to the company to spend time on those things may or may not necessarily be time well spent. It’s just frustrating. The “new project” experience from an enterprise perspective can actually be relatively rare. If you already have a product you’re working on and enhancing, likely you’re adding to something existing rather than building something Greenfield. I’d love to see more examples, documentation, and product/framework features that help/reward the long-term users. I use VirtualBox a lot. I have a few different Vagrant images, not all of which have Hyper-V equivalents. There’s also a lot of mindshare for VirtualBox as a default virtualization provider when it comes to working with Kubernetes and Docker tooling. Defaults are for VirtualBox with Hyper-V added later and not quite as flexible. Of course, you can’t have Hyper-V and VirtualBox running at the same time. It’s a problem many have run into. The default on Docker for Windows is to use Hyper-V and it pretty well hides the details from you to get things running. If you want to use VirtualBox, the common solution is to add an entry to optionally enable Hyper-V at boot. I want my VirtualBox / Vagrant images on Windows. And I want my Docker. How do I make that happen? Well, before there was Docker for Windows, there was “Docker Toolbox.” Part of Docker Toolbox was docker-machine, sort of like Vagrant but for bringing up a preconfigured Docker host. Conveniently, docker-machine runs in VirtualBox! So let’s get Docker running. First, install VirtualBox if you don’t already have that installed. Obviously you can’t have Hyper-V enabled if you’re doing this. Next, enable Windows Subsystem for Linux and install a Linux distro. I installed Ubuntu. No, it’s not. You can’t run Docker inside Windows Subsystem for Linux. At this point, you’ll see solutions where people install Docker for Windows and expose the daemon on port 2375. But… that requires Hyper-V, and we’re not using Hyper-V. So. Back in Windows land, go download docker-machine. Put that somewhere in your path so you can call it. This is the magic, right here. This will automatically provision a VirtualBox VM running a small Linux host that just exposes the Docker daemon. It might take a second, be patient. When it’s done you’ll have a VM called docker-host running. Those environment variables are the important bits. Jump back in WSL Ubuntu and edit your ~/.bash_profile to have those values. Note the cert path has changed a bit - WSL mounts the C: drive at /mnt/c so you need to update accordingly. Also, if you're not using Windows-formatted Docker Compose files, you probably don't need that COMPOSE_CONVERT_WINDOWS_PATHS bit, but I left it. Run source ~/.bash_profile to update the info in your environment. A VirtualBox VM called docker-host created by docker-machine up and running. A WSL Ubuntu instance with Docker installed and configured to use the docker-host daemon. You should get the message from the Docker hello-world container. Yay! Docker on Windows using VirtualBox! The IP address of the docker-host may change. docker-machine makes a DHCP server in VirtualBox that enables the daemon only for your local machine, but depending on how many Docker hosts you have running or other VMs using that network adapter you may see the IP address shift. You’ll have to update your ~/.bash_profile if that happens. You can change how much CPU and memory is associated with the docker-host you create. Run docker-machine to see the available parameters and help.